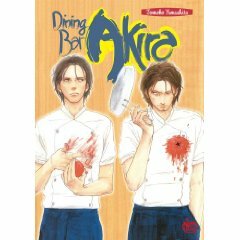 Dining Bar Akira vol. 1, written and illustrated by Tomoko Yamashita, Netcomics. I’ve heard great things about this boys’-love series. Mail vol. 1, written and illustrated by Housui Yamazaki, Dark Horse. Supernatural sleuthing and a nice mix of humor and horror make this a fine companion series for The Kurosagi Corpse Delivery Service. Manga: The Complete Guide, written and edited by Jason Thompson, Del Rey. This is a terrific buyer’s guide filled with succinct reviews and informative essays. I can’t tell if this is an updated edition or just a reprint, though. Satsuma Gishiden vol. 1, written and illustrated by Hiroshi Hirata, Dark Horse. This series got a lot of praise but fell off of Dark Horse’s schedule halfway through. Three of its six volumes have been published, the last in March of 2007. Translucent vol. 1, written and illustrated by Kazuhiro Okamoto, Dark Horse. I like this series a lot. It’s a coming-of-age drama about a girl who turns invisible against her will. It was originally serialized in a seinen magazine (Media Factory’s Comic Flapper), but I think it would click with the shôjo audience. Dark Horse just solicited the fourth volume after a long hiatus. As you may have surmised, Dark Horse is re-offering just about all of their first volumes. You are currently browsing the The Manga Curmudgeon blog archives for the day Sunday, February 28th, 2010.